Recently, I had the opportunity to read a book that was on my reading list. It was Floret Farm's, Cut Flower Garden book. I had seen some of her pictures and posts on Pinterest, and I was hooked. With my love of all things floral, I couldn't wait to dive into the pages and check it out. Not only was the book full of great information, but also full of beautiful pictures. I have to admit, I got inspired to want to create a small flower patch in my own garden where I too could grow rows of flowers for my own bouquets. I loved the idea of seeing the flowers all lined up and in mass. Although my little flower patch would be on a way smaller scale. Another view of the flowers at Napa Country Iris Farm. Close-up view of part of the Iris flower rows. Napa Country Iris Farm. So I made a list of some of the different flowers that I thought might be nice for creating my own home bouquets. As I was pondering some of my selections, I recalled that one of my friend's had mentioned an iris farm to me years ago. I decided to look into it. I knew the timing was about right. As luck would have it the timing was perfect for just such an adventure. I discovered that there were a few in Northern California, but locally I focused on two. One of the farms was the Napa Country Iris Farm (NCIF) located very near Lake Berryessa and the second was the Horton Iris Garden (HIG) in Loomis, California. Pretty ruffles on this peach and pink colored iris. Both of these iris flower farms were quite charming. Looking at the Napa Country Iris Farm, it was located in a valley just beyond the lake. 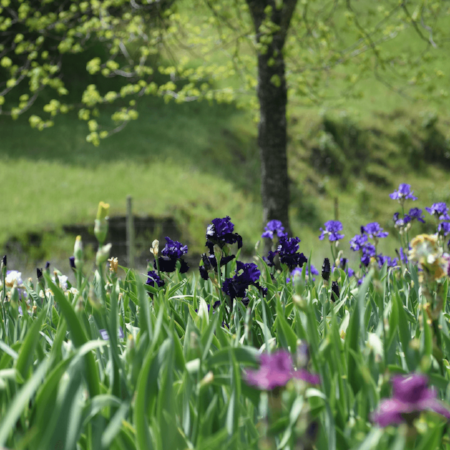 It is a beautiful drive to get there and when you arrive they have a nice spread out lawn area where they have their iris plants in rows with their name tags. NCIF also grows peonies, one of my most favorite flowers, and to my delight, they had an incredible selection of different varieties. Some of which are hard to find at the local nursery. NCIF had a beautiful picnic area which we (myself and a few friends) were able to take advantage of on our visit. They had two separate sections where you could purchase both the peonies and iris varieties available. The owner was very helpful and kind in assisting us with our questions. Although it was a little bit of a drive from Sacramento, it was well worth the drive and the effort. It proved to be a very lovely day. Another view of the Napa Country Iris Farm. These coral colored peonies were as large as salad plates! This beautiful white ruffled Iris is called Guardian Angel. A few days later a friend called and invited me to HIG one morning. I couldn't resist so off we went. HIG was much closer, and it didn't take us long to arrive. Both farms are family owned and operated. At HIG when we arrived they had a table out front to greet visitors which was very nice. They also had a catalog of the plants they offer with the prices listed (cost for catalog $1.00). In addition, they had pencils and paper so you could make a list of the flowers that you liked best. This was a great idea as sometimes it is easy to forget which you like when there are so many beautiful varieties to choose from. HIG also had tables and chairs for you to sit and eat. They also have lots of decorations in their fields like antique pieces that were added to the gardens. For example, in one of the corners of the garden they had an antique iron bed filled with flowers giving flower bed a whole new meaning. At NCIF, I learned that both peonies and iris flowers are grown in full sun. Peonies prefer more water than iris flowers, but both like well-drained soil. At HIG, I learned that some iris flowers are scented. I was under the mistaken impression that they didn't have a smell. To my delight, I discovered that some do. One variety in particular that I really liked and ended up purchasing was Edwardian Lady. Edwardian Lady to me smells like the bubble gum we used to have as kids, Razzle Dazzle. It has kind of a soft fruity fragrance. Another iris that I came across smelled like licorice. In addition to viewing all these gorgeous blooms, we took away some lovely photos of our day well spent. One thing to remember about both places is they tend to be only open on weekends. The season is only open when the blooms are open. There is about one more week left before they will be closed for this year. Both places have lots of information to help you get ready for your visit. To view the sites for the book, and the gardens just click on the links.